There is so much to unpack here. My first exposure to Cline came via Etsy (here and here). 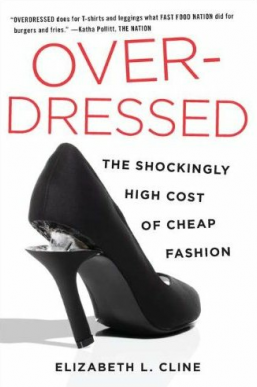 Her book, Overdressed: The Shockingly High Cost of Cheap Fashion, explores the global impact of fast fashion. She details America's drastic increase in inexpensive clothing imports and does excellent work diagramming the lifespan of a garment and charting its historical changes. She lays out an argument for the inherent costs in the bargain basement prices we've become accustomed to paying. And she addresses the charged issue that while production dies in one place, it soon flourishes in another, even if it may not pay a living wage. It's a lot. From fabric quality to garment construction, the life and death of the department store to the changing calendar of seasons, Cline negotiates a vast terrain. Taking us from what remains of the Garment District in New York City to the factories of China and Bangladesh, she explains how industry trends have literally impacted the way we dress. It's engineered obsolescence for clothes: garments that are hyper on-trend, not meant to last and hardly made well enough to justify the cost of mending or alteration. In sum: things really aren't made they way they used to be and while we pay less for our them, we buy them all the time and more than ever (see: haulers). We've lost the relationship we used to have with our clothes (in the form of tailoring or mending) because they no longer make sense with the disposable garments we bring home. This is an important discussion and I like this book very much. However, I wanted a more involved discussion of the class issues involved in telling people not to shop at Old Navy, Target or Forever 21. Cline does highlight a couple of independent designers and talk about her own struggles to pay more for one good jacket instead of ten bad ones but class issues feel like they should be more of the education as they make up so much of the resistance. There's a balance to be struck in talking about sustainability and responsible shopping while still tackling issues of entitlement and income. (Don't even talk to me about how Walmart's slogan is: Save money. Live better.) These are big issues, bigger than any book can handle at once. Still, reaching those people is part of the work: everybody lives worse and wants to pay less for everything they feel they deserve. Time for the navigation of shared psychological inroads, planet!